Size M1.6 upto 16 mm / 1/8" upto 5/8". We are the manufacturer and exporter of wide range of Circlip e-Clips. These can be used with applicators and dispensers for rapid installation that results in sharply reduced assembly costs. These E Clips are made of high quality raw material using latest technology. These are widely used in motor and automobile industries. Available in a wide range of sizes, dimension and thicknesses. Size (Dia): M1.6 upto 16 mm / 1/8" upto 5/8". Length: 5 mm upto 200 mm / 1/8" upto 10". 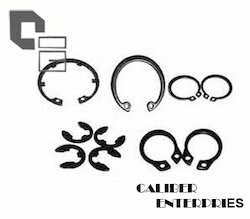 Looking for Circlip E-clips ?